Just as ads can be used to monetize your website, they can be added to emails as well. You can sell ad space yourself, track the statistics and manually insert the jpgs or gifs into each mailing, or you can join the FeedBlitz Ad Network and let us do the work for you! FeedBlitz works with a set and forget ad network, LiveIntent, to handle all the details, removing the headache and guesswork that can accompany monetizing with ads. 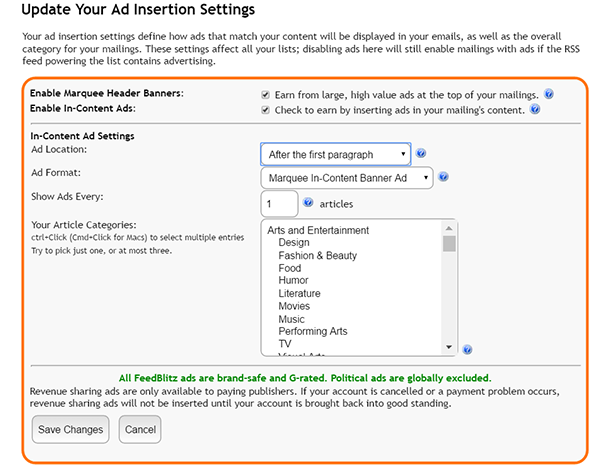 With this system, publishers are able to enable ads in their chosen category, and then never give them another thought. Pro Tip: This monetization strategy is ideal for sites who publish frequently and rely on consistent content production to drive their earnings. Similar to banner ads on the web, the revenue of these ads are CPM. ) The more opens, the more ad views, the more income you can generate. You can check your earnings at anytime by logging into FeedBlitz, clicking on Earned Ad Revenue and then clicking Earnings. Activation Emails – Ads can distract the potential subscriber from clicking the link and completing the subscription process. Sales Funnel Emails – The goal of your email is for the subscriber to perform an action other than consuming content. Minimize any distraction from your goal of moving subscribers along your sales funnel. Sponsored Content – You don’t want your sponsor to have to compete for your reader’s attention, or worse have a competitive brand’s ad display in the same mailing. Very Personal Notes – Sometimes we as publishers have to write about situations or events which are too personal, too important, or too sad for ads of any kind to be appropriate. Use the tag noads in your post for ads to automatically be removed from that mailing only! Affiliate programs can be a great revenue generator depending on your niche. Caution! Not all email service providers are affiliate-friendly. FeedBlitz of course is, but should you be working with another provider, please be sure to check their terms of service before proceeding. Additionally, be aware that not all affiliate programs allow links to be sent via email. Affiliate links can be added to any mailing where they would make sense. It can be as simple adding an affiliate link to a product you mentioned or adding linked images for products related to your topic. Once you’ve been accepted into an affiliate program and know the rules, you can add the links wherever they make sense and fit the program’s guidelines. If your list has a strong focus or is geared to a specific demographic, you may find brands that are interested in buying sponsored content. You can get very creative with who you approach for this avenue of monetization. The important thing to remember is to ensure the content offers the same value you promised your subscribers when they joined your list. Before approaching a brand with a sponsorship proposal, you will want to have the following information handy. Set the number of emails and their schedule as part of the package. Include the number of subscribers, as well as your open and click through rates. Don’t forget to give a brief summary of your readers’ demographics! Decide whether you will be offering a focused newsflash (content sent only to the list and not posted on the site), the exact content posted to the site, or an introduction and teaser to encourage clickthroughs to the full content published on your site. Offering a sponsorship can be used as an upsell or a negotiation tool to secure a better rate. If the campaign is set to run for a select number of days or weeks, consider adding the sponsor to the mailing’s template with a banner or by thanking them in the footer of each mailing sent during the campaign. You don’t have to start with large corporate brands to begin earning sponsorship revenue. It is often easier to attract smaller brands to build your portfolio before reaching out to larger businesses and corporations. And let’s not forget compensation can come in forms other than money! (Even if that is our favorite and the one we use to pay the bills.) You can always explore trades of services or a group post sharing to wet your feet with sponsored or affiliate content. Before you begin monetizing your mailings, you first need to fully and completely understand your reading audience. Take a few minutes to write a bit about them: How old are they? Where do they live? What is their family situation? Their hobbies? What are their interests and other websites they may read? Next list the top 3 topics you write about and then brainstorm a few items that could be associated with those topics. For example: If you write a lot about organization tips, you can associate items like planners, shelving or cleaning supplies. Now look at everything you’ve written down. You’ll have a good idea of the type of ads your readers may enjoy as well as possible sponsors or affiliate partnership potentials to reach out and work with. You can take this exercise into much greater detail, or just do a quick run through in 5 minutes or less to get your mind thinking about monetizing. Monetizing your mailings is a great way to generate income from your writing, but it isn’t always for everyone. Next week, we will touch on some common worries many publishers have before monetizing, and some warning signs that may mean you have gone too far. For those who are already generating income with their mailing, we’ll discuss a few ways to take your monetizing to the next level. Do you have questions on the best practices to begin monetizing your mailings or how you can enhance your ad program? We are here to help! Send us an email at support@feedblitz.com, chat, check out our Help Forum, or give us a call at 1.877.692.5489. Our Support and Sales Desk is available Monday – Friday from 9 am to 5 pm EST.